This map demonstrates the interest in worldwide collaboration. Those countries with national research and education federations participating in eduGAIN are in green, with countries in the process of joining in yellow. MILWAUKEE – Internet2’s InCommon has enhanced its support for international research organizations through a pilot project with the Leonard E. Parker Center for Gravitation, Cosmology and Astrophysics (CGCA) at the University of Wisconsin-Milwaukee (UWM). 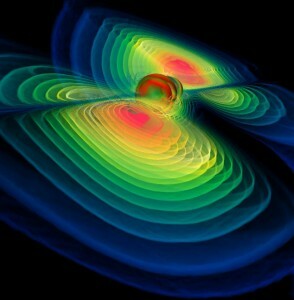 Computer simulation of two black holes merging into one, and the release of energy in the form of gravitational waves. Photo credit Bernd Brügmann, Max Planck Institute for Astrophysics. The pilot will enable astronomers worldwide to use their local campus credentials to log into three UWM-based services, including astronomers from Laser Interferometer Gravitational Wave Observatory (LIGO), a project to detect and study gravitational waves from astrophysical objects such as black holes and supernovae. The CGCA plays a key role in LIGO, which was the impetus for creating these collaboration services for astronomers. By participating in the pilot, CGCA identity management staff are streamlining the access process to these important tools, while simultaneously saving time and effort by not having to create and maintain separate user IDs and passwords for hundreds of researchers worldwide. The new approach will enable researchers to gain immediate access to these resources by simply logging in with the home campus-issued credentials they already have in place. InCommon has previously partnered with CGCA and LIGO to provide secure federated access for researchers at U.S. institutions. By joining the international eduGAIN service, InCommon extends this benefit to researchers in other parts of the world. InCommon participants can make this process even easier by supporting the Research & Scholarship (R&S) program, in which a campus automatically releases a small number of user attributes to all services tagged as R&S. This allows researchers to access a service with little or no intervention from their central campus IT department, while still maintaining full control and being in full compliance with federal, state and campus privacy requirements. The global InCommon-eduGAIN pilot involves exporting the metadata about three CGCA services to the international eduGAIN service, which provides trustworthy exchange of information among national research and education federations, like InCommon. The three services include: the Gravitational Wave Astronomy Community Registry; the Gravitational Wave Astronomy Community Wiki; and the Gravitational Wave Astronomy Community List Server. All three services are tagged for R&S. Internet2® is a member-owned advanced technology community founded by the nation’s leading higher education institutions in 1996. Internet2 provides a collaborative environment for U.S. research and education organizations to solve common technology challenges, and to develop innovative solutions in support of their educational, research, and community service missions. Internet2 also operates the nation’s largest and fastest coast-to-coast research and education network, in which the Network Operations Center is powered by Indiana University. Internet2 serves more than 93,000 community anchor institutions, 250 U.S. universities, 70 government agencies, 38 regional and state education networks, 80 leading corporations working with our community and more than 65 national research and education networking partners representing more than 100 countries. For more information, visit www.internet2.edu or follow @Internet2 on Twitter. InCommon®, operated by Internet2®, serves the U.S. education and research communities, supporting a common framework of trust services, including the U.S. identity management trust federation for research and education, a community-driven Certificate Service, an Assurance Program providing higher levels of trust, and a multifactor authentication program. InCommon has more than 600 participants, including higher education institutions and research organizations, and their sponsored partners. As Wisconsin’s premier public urban institution, UW-Milwaukee enjoys a growing national reputation for excellence in research, teaching and community engagement. On an operating budget of $680 million, it educates nearly 28,000 students and is an engine of innovation for Southeastern Wisconsin. The 104-acre main campus and satellite sites are located in the economic and cultural heart of the state. The university’s recent expansion includes new academic and research facilities, including the Joseph J. Zilber School of Public Health and the only School of Freshwater Sciences in the United States. For more information, visit http://www4.uwm.edu/ or follow @UWM on Twitter. The Leonard E. Parker Center for Gravitation, Cosmology and Astrophysics (CGCA) is supported by NASA, the National Science Foundation, UW-Milwaukee College of Letters and Science, and UW-Milwaukee Graduate School. By bringing together expertise in gravitational physics, astrophysics and computing, CGCA can address scientific challenges in relativistic astrophysics, gravitational-wave astronomy, particle astrophysics, cosmology, and quantum gravity. For more information, visit http://www.gravity.phys.uwm.edu/.